Alston Event Rentals is your trusted party rental company . Please take your time and browse around and check out our robust inventory of specialty items, such as whiskey barrel tables, farm tables, multiple styles of outdoor lighting and don't forget to visit our dance floor page. Make sure you don't forget to check our recently added water slide and bounce house rental categories. If you plan on having a large event it's important to make sure your guest have a chair and in a spacious table so they can enjoy your event in comfort. Rest a sure here at Alston Event Rentals we make renting a table and chair easy with our online booking system. 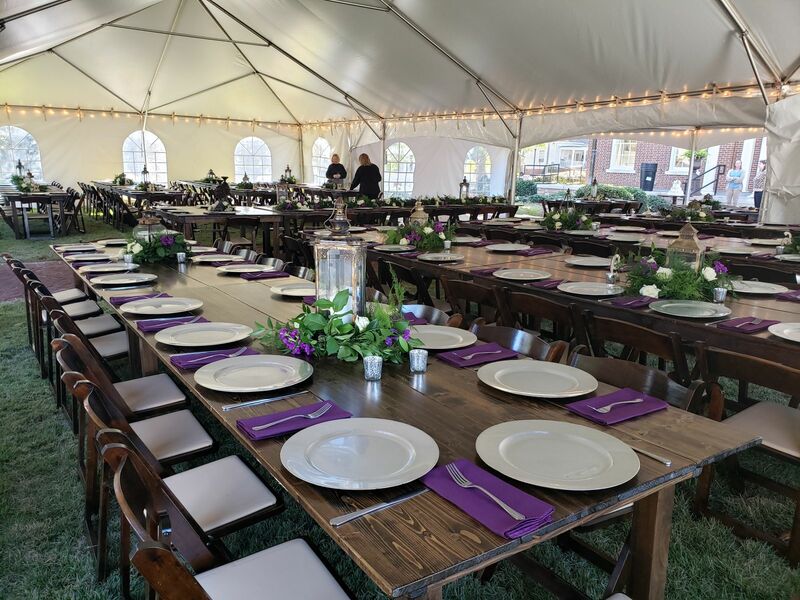 We also offer unique tables such as farm tables and whisky tables and we even carry an abundance of classic round tables and banquet tables. Not sure what you're looking for? Just pick up the phone and call us and we will gladly help you design your next event space exactly as you want at a price you can afford. Let our highly experienced staff do all the heavy lifting so you can enjoy your friends and family. We are much more than bounce houses or moonwalks. We are a full-service event rental company. From fun to formal, we have you covered, literally. That's right, we also rent commercial grade tents for small to large events. Alston Event Rentals offers beautiful wedding tents from a 10x20 to 30x60. Our tents are made by top USA manufacturers and treated with care at all times. 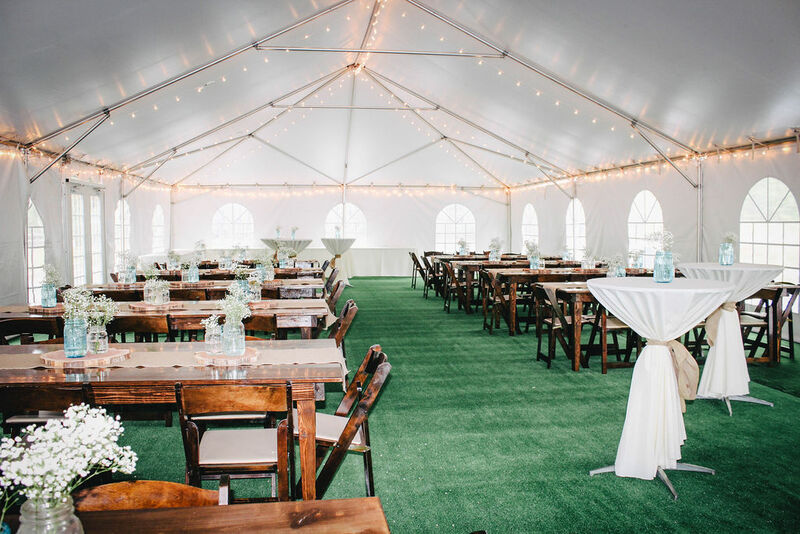 We also rent lighting for our tents, lighting with stanchions, projectors and projector screens, multiple options of tables and chairs, whiskey barrels, farm tables, and more. It's easy to schedule your party rental for a special event or birthday. And don't worry, we do all the work for you. First, take a look through our bounce house and interactive inflatables selection. The dry slides and yard games are a blast, and you can never go wrong with the classic moonwalk! Are you feeling a little more adventurous? Then head on over to take a peek at our awesome water slides! Keep in mind, our professional team handles 100% of the delivery and set up. This way, all you have to worry about is climbing up to the top of the water slide and enjoying the ride down. If you want the best of both worlds, we recommend our combo water slide bouncer that comes equipped with 2 lanes for easy access. 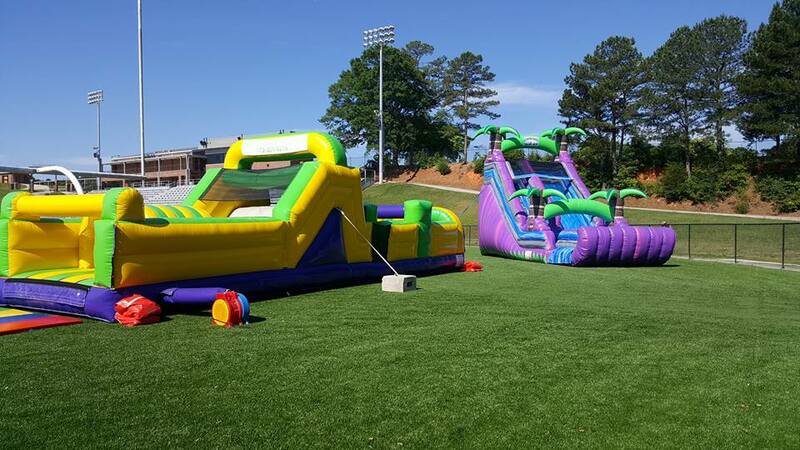 Please note that our inflatable bounce house and water slide rentals book up very quickly. Make sure you complete the rental process of checking out after you add the inflatables to your cart. 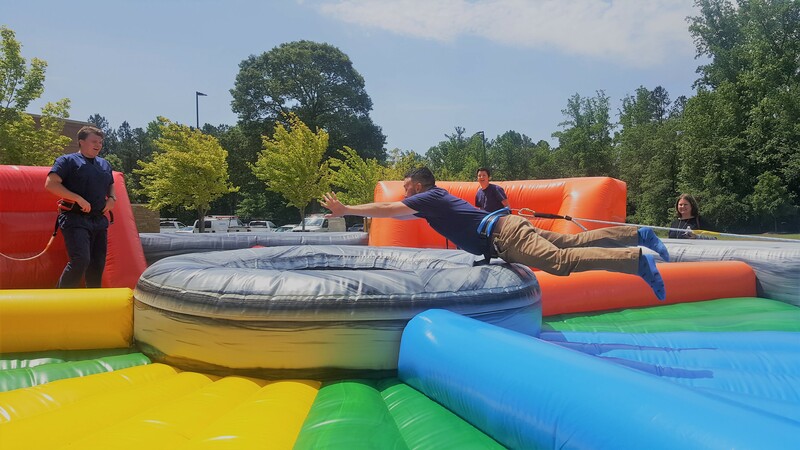 Our company, Alston Event Rentals, supplies party and inflatable rentals in Newnan, Georgia. 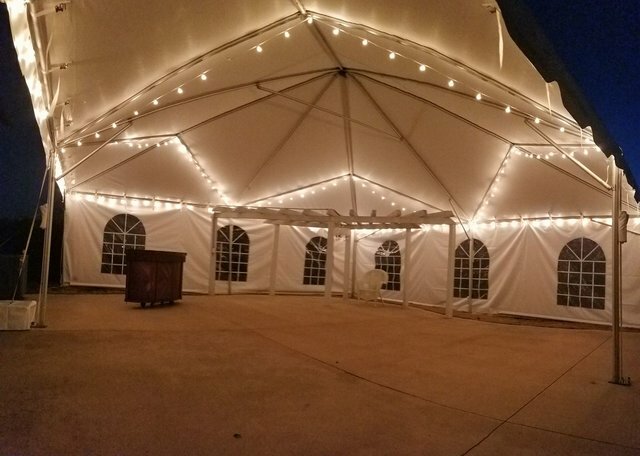 We offer the following rental items; tents, tables, chairs, bounce houses, farm tables, lighting, PA systems, projectors, fans, heaters,yard games, movie screens, chafing dishes, and more. We cater to wedding rentals, birthday parties, corporate events, fall festivals, spring flings, church events, community events, graduations, and all special events. We proudly serve the Atlanta South Metro and West Georgia areas. This includes the following cities: Newnan, Sharpsburg, Hogansville, Senoia, Grantville, Luthersville, Peachtree City, Fayetteville, Carrollton, Bremen, Bowdon, and Douglasville. Counties include: Fayette, Coweta, Fulton, Troup, Meriwether, Douglas, and Carroll. We offer delivery, setup, and takedown. Delivery and takedown prices depend on location, accessibility, and inventory rented. We also offer table and chairs set up for a small fee if desired. Thank you for your interest in our company and we look forward to serving you. Let's face it. Outdoor lighting can make or break an event. We can hang cafe lights in our tents as swag lighting & perimeter lighting (talk about atmosphere!). 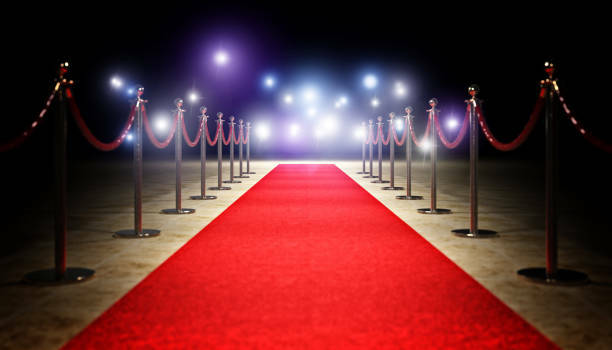 Let us come out for a site survey so we can offer an elegant experience for your deserving event. 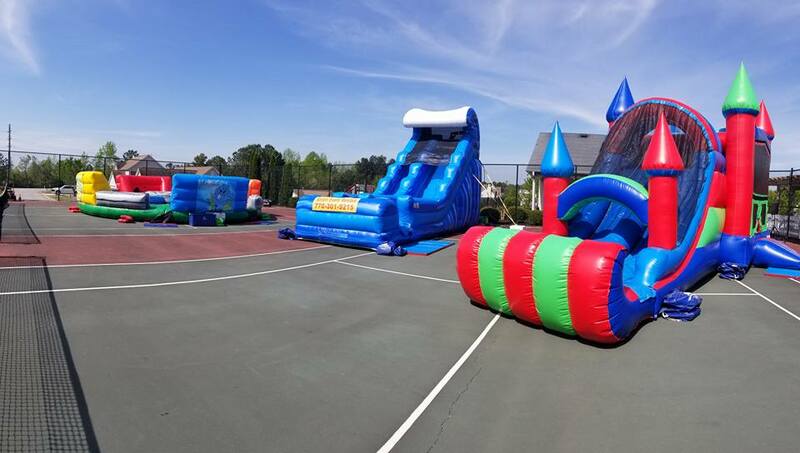 Our inventory of inflatables covers all ages and all types of events. From backyard birthday parties to Corporate events, there is a bounce house that fits the bill. Still not impressed!? How about our Giant Ferris Wheel Inflatable or Human Hungry Hippo! You have a choice of a variety of wedding packages. And we're located right here, in Newnan Georgia, to help make your big day easier. Not only do we offer wedding packages but we will customize a package just for you and your special day. Don't forget to add lights, linens, drapery, dance floors, and farm tables to any package to personalize your wedding.